Grandma and grandpa aren’t too excited to let Nithya try their pickles. 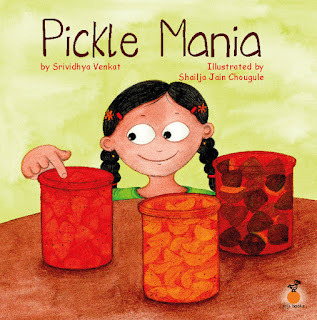 Nevertheless, Nithya can’t wait to sneak in, and have a taste of the pickles while her grandparents are away. What follows after much pleading and begging is that Nithya learns to make her own little pickle with grandma’s help. What happens during the process of pickle-making makes for the rest of the plot - one that is a riot of fun, color, filled with sensory explosion to tantalise your taste buds. 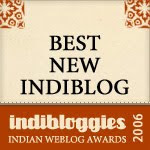 The attention to detail comes through the illustrations by Shailaja Jain Chougule. The cheerful and kid-friendly drawings capture the little girl’s fascination for pickles and evoke beautiful grandparent-granddaughter connections. Written by Srividhya Venkat, Pickle Mania is one “licky lick, dippy dip”, tangy-as- tamarind and sweet-as-jaggery kind of a delicious picture book that encourages problem-solving. Zippy, light and fun descriptive words make it a great read-aloud book for the 4 to 8 age group. All in all, I found this to be a warm and likeable book, perfectly suited for the pickle-loving daughter in the family who promptly devoured it. A picture book that celebrates family traditions around pickles and the passing down of joys of these tastebud stimulating foods, while subtly encouraging kids to try new foods. Essay writing is extremely distinctive and rattling that’s why this becomes very exhausting to induce employed the skilled essay author United Nations agency has the extraordinary mind to write down the most effective essay for you. Our edu birdie.com Reviews web site will assist you to induce the most effective essay author for you, United Nations agency have the good thinking ability to write down the nice and pregnant essay of your topic.